Every year, since so many years before, people (male and female) from the villages beneath Everest go to the Namche area as porters, students, cooks, house workers, suppliers of crops, and small time vendors mostly during tourist season. But some stay throughout the year and some throughout their lives, waiting upon the houses of locals who now are in Kathmandu or overseas. The most expensive tourist destination in Nepal, the Everest region, has benefited the inhabitants in and around the base camp much in terms of economic growth. Apart from the peak tourist season, its no surprise that they do not stay much in their native place as they already have enough resources to move to Kathmandu or even New York for that matter. But those other people, those who come from villages beneath Everest, theirs is a different tale. Their tales remain untold, sidelined by the glorious tales of brave “sherpa”. We have seen numerous photos of porters carrying stupendous amount of loads on their back in any typical Everest Base Camp (EBC) trek photos. Issues of low wage, difficult working conditions, harassment etc. are also heard from time to time. But how far have we really looked into these porters, and the other numerous people who throng the EBC route as cheap labors? The tales of bravery, human endurance, of the agility of our “Sherpa” brothers are commendable, and it is understandable that they have mostly stolen the limelight. But it is important that the background workers, the many men and women who helped them help the tourists and the climbers also get due recognition. It is important to know that even behind the tag name “Sherpa” there are many different people, some may be Sherpa-some may not be. I want to talk about those “Sherpas” who are the background of the Everest economy, who we do not know, who we have never heard of but who we collectively ignore as that large clump of “porters” and “sherpas”. A month ago, I had the chance to trek through the lower belt of Everest, spend a few weeks there and feel the vibe of people- who I have realized- have been carrying Namche and Everest on their back. Through these photographs, I want to attempt to tell a small part of their tales, show the unheard of places of their birth, and also show their hardships. 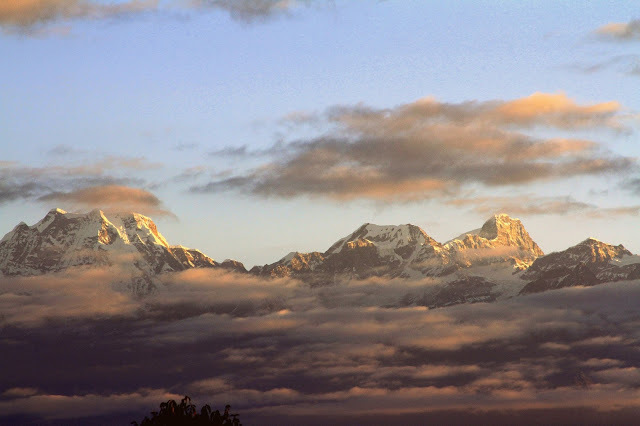 Their home is no less beautiful than the EBC area, but alas they do not have Everest in it. Robert Frost have poignantly expressed that taking roads less travelled “makes all the difference”. So was it with me. After landing in Salleri, the headquarter of Solukhumbu, instead of heading up towards Namche the well frequented trekking route, I instead trudged downwards which made all the difference. Almost a decade ago, an organization called dZi Foundation followed footsteps of the porters back home and came across these remote overshadowed areas. I followed the footsteps of other dZi staffs, and discovered an entirely new story – of people who carry Everest on their “doko”. The chief occupation of people of remote Bung, Cheskam, and Gudel VDCs of Solu- through which I trekked, is to go to Namche during peak tourist season to either work as porters or be a domestic help in the numerous hotels. 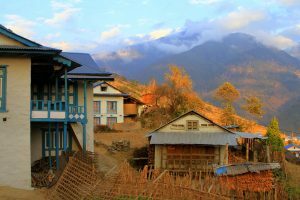 I encountered people who could not speak Nepali properly as some of the areas are totally ethnic Kulung settlements with their own language, but they spoke French and English. One eager person even served us “organic coffee” imported from Thailand because it so happens that he is a cook during trekking season and had some leftover coffee from last season. Every adult had gone trekking, most more than once. It is at least 4 days trek to Namche from the nearest village. One recent SLC graduate from Cheskam tells me with emotion that there isn’t a single house in his village from where at least one member hasn’t gone to Namche to carry load. My travel companion from Chaurikharka tells me of the story of a “Cheskame Baje”(Grandpa from Cheskam) who ever since she knew has been a kuruwa (housekeeper) of one of her friend’s house in Namche. Earlier, even young kids used to come up to Namche as there were good schools with scholarships provided by organizations such as the Hilary Fund. These kids brought millet, maize, and other grains from their home. Besides going to school, they sweated in the fields of the owners of the house where they resided. 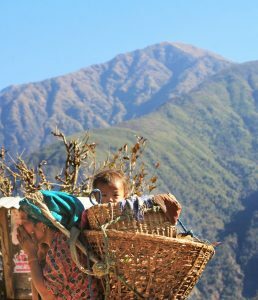 Even now, although the choppers transport many things, millet and many other essential grains are still carried by these people every season to Namche. Before Everest was discovered, the people from high up descended down into these areas to purchase these grains. But now, everything is carried upwards. Everest has changed the socio-economics of this region drastically. When we say Solu, we only think of EBC, and the solid economy of this district built around its strong touristic appeal. I for one never realized that there would be such underdeveloped areas like these in Solukhumbu. More than that, I always believed that it was the Sherpas of Khumbu and Namche who were the trekkers, guides and hoteliers of the Everest region. What a moment of awakening it was for me, when I travelled these villages and got to know that the people from here were the unheard of, unacknowledged supporters of the Everest tourism business. That while the Hotel did not belong to them, chances are more likely that they would be cooking the dish and cleaning the tables. While they did not own any trekking agency, that they would be the ones carrying the loads and making our stay at Everest safe and comfortable. A smiling man who was going to Nele Bazaar to carry “sahu ko bhari”(merchant’s load) asked me to take a nice picture of him while he saw me clicking away at the mountains. He told me, it was not the season to carry “gora ko bhari”(foreigner’s load), but the stomach did not differentiate between season so he had to carry someone’s load anyway. So it was of the local merchant this time of year. Another older person, who worked as a porter all his life, and has now returned to his village permanently shared his secret that “tourists (meaning Europeans) were like buffaloes. Large, bulky who needed feeding, guiding while taking care of every need. A European or American (who fit the bill of standard “khaire” appearance) may be deeply offended by this observation. I find it a little humorous about how naively clueless his example sounded. But what I find appalling is that we are equally clueless about these generous souls who have carried the Everest economy on their back for so long, who have remained in the shadows of Everest.